Office Space - Oswestry, Shropshire. 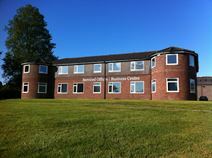 This freshly refurbished business centre offers a range of serviced offices, complemented by a range of business support amenities. Travel connections are excellent, with the train station just 2 miles away offering services to Cardiff and Birmingham, and local bus routes serving the area regularly. Just a mile from the space is the town centre of Owestry, offering a range of places to eat, drink and shop.